Americans are awash in debt. Credit undergirds daily life more than ever before—it is one of the defining aspects of life in the United States today. The damage from a depressed housing market is exacerbated by the subprime lender implosion, sending shock waves through the financial sector, international economies, and the presidential campaign. Most low- or moderate-income people borrow, but they are doing it to stay afloat rather than to keep up with the Joneses. How did things go so wrong? How can we maintain and expand access to credit while protecting the consumer and avoiding a reoccurrence of the current crisis? In Borrowing to Live, the Joint Center for Housing Studies of Harvard University bring together an elite group of experts, an eclectic group drawn from the best of academia, research, and public service. 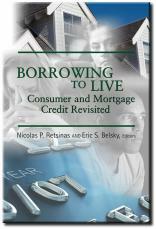 Together with editors Nicolas Retsinas and Eric Belsky, they dissect the current state of consumer and mortgage credit in the United States and help point the way out of the current impasse.